Hey there, my name is Robyn Lessley and I am a Strategic Intervention, Self Empowerment, and Relationship Coach. I am also a mom of two beautiful girls. I have been on a path of self improvement since I was 17 and I got involved with Amway. That was the first group of people that I had been around that encourage you to grow and to get better. I started reading self help books back about 29 years ago. I have been an entrepreneur since I was 17 and have been involved in many different businesses and I have a lot of knowledge about business in general and about marketing. It wasn’t until my 40th birthday that my view on life had changed. You see, I walk on fire that day, it happened to be the same day Oprah walked on fire. What I am talking about is I went to an Unleash The Power Within event put on by the one and only Tony Robbins. When they say “your life will never be the same again” they mean it. I got inspired to become a coach after going to two Tony Robbins events. I was completely hooked at the thought of helping people on a massive scale after I saw Tony empower over 7,000 people in those two events to make dramatic and lifelong changes in their lives. I myself had overcome a 30 year mentally crippling event in one hour. WOW! I had never ever felt so alive! When you are at an event like that and you see people overcoming major hurdles in their lives, right before your eyes, you think to yourself that you wish every person that you know was there. You want to tell everyone. One month later I had the chance to go through a coaching program that teaches you how to become a Strategic Intervention Coach like Tony Robbins, and the best part was, it was taught off of the trainings of Tony Robbins and Cloe Madanes, Robbins Madanes Training. How fricking exciting is that?! As a Strategic Intervention and Relationship Coach, I am trained to coach everyone for every area of their lives. I have been pulled, however, to focus on relationships. EVERYONE WANTS LOVE! They really do. Now there are people that swear off love because either they have never experienced it or they have been hurt and they are afraid to get hurt again. It is our human nature to not only want love but it is actually one of the 6 Human Needs, that we have to meet that need. I am grateful that you found me and I am excited to help you create the passionate juice in your life. If you have not checked out my book on Amazon Kindle yet, here is a link to it. You will learn an amazing amount of stuff from the book and by doing the action steps in the workbook. 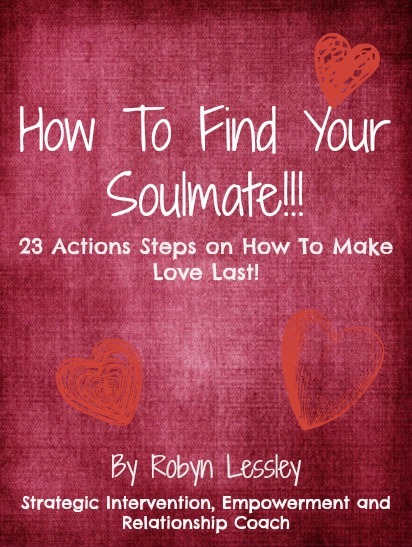 It is called How To Find Your Soulmate: 23 Action Steps On How To Make Love Last. This book is titled How To Find Your Soulmate and there are some action steps in there that are designed to help you find someone, but almost all of the action steps will help you to learn about and fix a relationship that you are in now too. I highly recommend that you get the book and do the action steps.